8mm (from hole to hole) x 12mm (wide) 3-petal flowers with grooves on the sides and the hole through the middle of the flower. 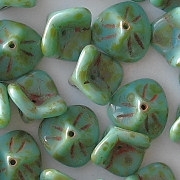 Opaque turquoise (light teal or greenish-aqua) with a mottled brown "picasso" coating. I also see a coral red coating in the center of some of the flowers, and in the grooves on some of the flowers, but not in all of them. 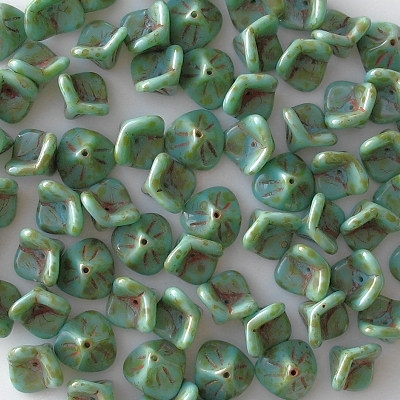 The pictures revealed that many of the beads have small fissures in the centers of the flowers. Flowers like this often have small fissures; but the fissures don't seem to affect the strength of the bead, and they aren't visible to the naked eye (unless you look hard for them), so I haven't reduced the price. 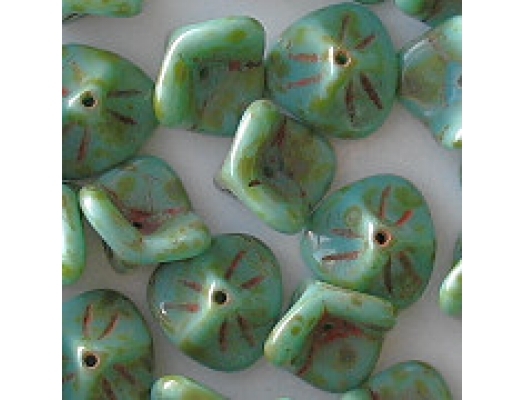 Turquoise picasso beads are always popular.